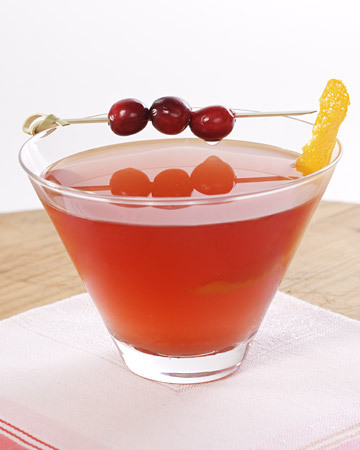 CRANBERRY COSMO: Homemade cranberry- and orange-infused vodka is the base of these deluxe cosmopolitans. The classic cosmo ingredients -- cranberry juice, orange liqueur, and lime juice -- complete the cocktail. Click here for the recipe. POMEGRANATE-CHAMPAGNE PUNCH: Pear nectar and orange liqueur are mixed with pomegranate juice and a bottle of Champagne to create this easy, elegant punch. In place of the Champagne, you may use Prosecco or Cava, or any other variety of sparkling white wine you wish. Click here for the recipe. SORBET AND CHAMPAGNE COCKTAIL: The classic Champagne cocktail is updated with sorbet in place of the traditional sugar cube and bitters. Use raspberry, passion fruit, lemon, or whichever sorbet flavor you prefer. Click here for the recipe. 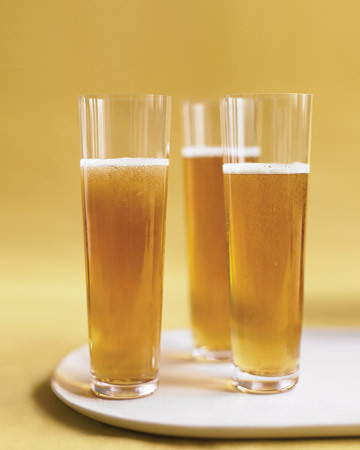 COGNAC SPARKLERS: The distinctive flavor of Cognac is perfectly complemented by the soft sweetness of sparkling apple cider. A few dashes of bitters in each glass add just the right balance to this cocktail. Click here for the recipe. 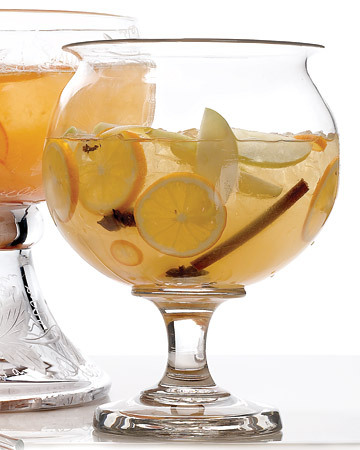 MULLED WHITE-WINE SANGRIA: Honey syrup is infused with lemon zest, star anise, cinnamon sticks, and cloves, and mixed with dry white wine and sweet orange Muscat. This white sangria is garnished with a bounty of winter fruit, including apples, pears, Meyer lemons, and kumquats. Click here for the recipe. 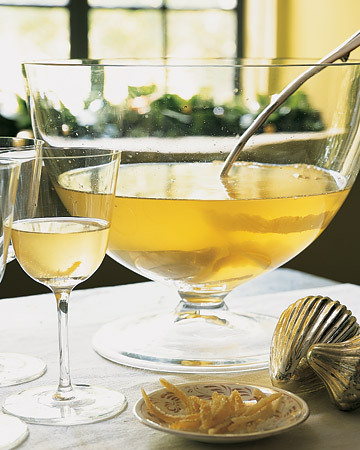 LEMON-DROP CHAMPAGNE PUNCH: Simple syrup infused with lemon zest adds aromatic sweetness to this punch made of vodka, lemon juice, and a bottle of Champagne. 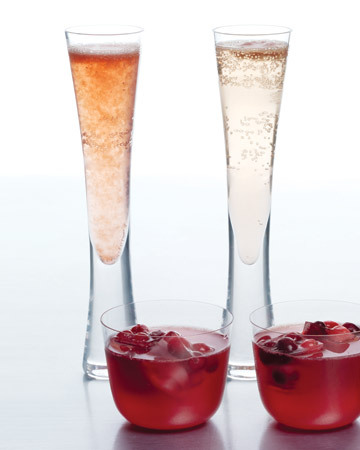 Garnish each glass of sparkling punch with a strip of candied lemon peel. Click here for the recipe. Oh wow! 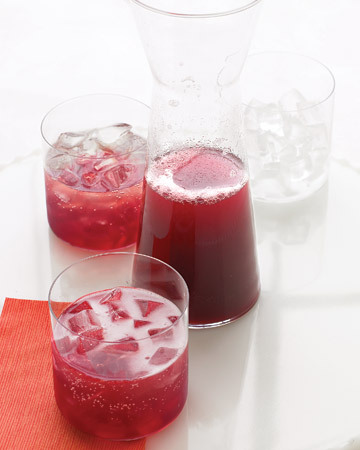 The POMEGRANATE-CHAMPAGNE PUNCH!!! Yum YUM!!!! Perfect for any party. Here's wishing you, Andrew, a very belated Merry Christmas and an early Happy New Year! Thank you for all your dedicated and beautiful blogging; cheers to 2011!